Khanom bueng is a Thai dessert that rather difficult to prepare, contains a variety of ingredients, such as flour, and various toppings. The main ingredients, however, are ground green gram or mung bean flour – a vegetable source of protein. The coconut milk, mixed with mineral salt and containing protein and vitamins, provides energy and fat; and a sweet topping is a source of protein derived from eggs, together with amino acids and valuable mincrals. Overall, kanom buang is a rich source of protein from eggs, which in turn is converted into energy, as is the carbohydrate and fat from coconut, coconut milk and sugar. The end result is a delicious and mouth-watering dish. 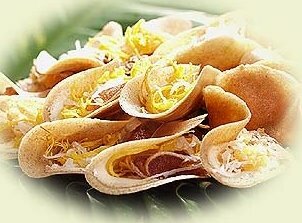 And then, Khanom bueng is Vegetarian Foods and use in period Kin Jay festival. That is good idea for Vegan.